Why Be Curious? Pigato grows throughout Liguria, but the best is in the “zona dell’ albenganese”, or the region around and above the coastal town of Albenga. 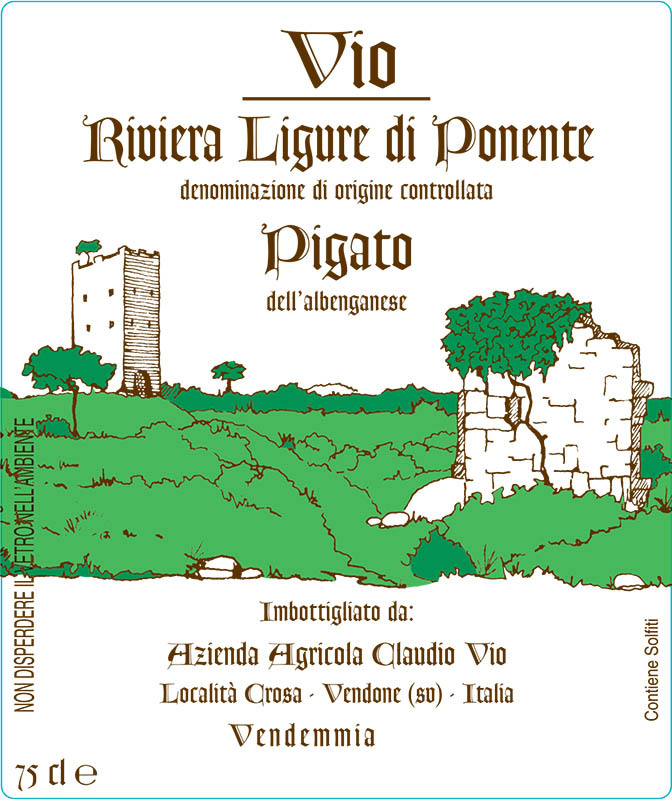 Jancis Robinson’s Wine Grapes book says, “Morphological and DNA comparisons have clearly established that… Pigato and Vermentino are one and the same variety”, but Ligurian growers disagree. The grapes certainly don’t look the same in the vineyard, and the resulting wines taste different, even when vinified the same. The name “Pigato” comes from a dialect word meaning freckled and refers to the spotted appearance of the grape skins. Fermentazione alcolico / Alcoholic fermentation: 25 days (incl. ~18 hours skin contact), 18-20°C.